Theatre for Transformation is a non-profit interdisciplinary art organization that heals the world through performances, workshops and showcases that re-shape how we understand our history and our local communities. 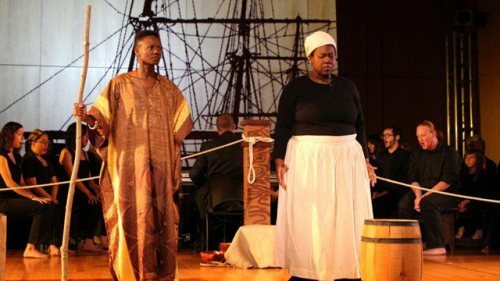 Our aim is to create and tour interdisciplinary performances with music and drama about African American history for diverse audiences. A touring company, TFT has traveled to over 100 schools, faith communities, community centers, and universities since our founding in 2007. The company has performed its original works at Stanford University, Haverford College, Franklin & Marshall College, Neumann University, Northeastern Illinois University, and many others. TFT’s plays have been awarded by the Pennsylvania Humanities Council, the Pennsylvania Council on the Arts, and other organizations. Theatre for Transformation relies on the generosity of its donors annually to create works which engage and inspire our communities. We graciously accept all donations in any amount. Donations can be made via Paypal or credit/debit cards through the ‘donate’ link immediately below. To make a gift to TFT via check, please see our information here. Every gift makes a difference! To receive newsletters and event information from TFT, including updates on our 2018 production of We the People…14, subscribe now to our mailing list. Our Mission: To perform African American stories that inspire learning and racial harmony amongst diverse audiences.